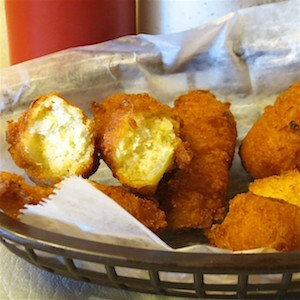 You haven’t truly sampled an important culinary morsel of the Deep South until you’ve tasted a hushpuppy, and the VERY BEST hushpuppies (according to locals in the know) are created at Greenbrier Restaurant near Athens, Alabama. Hushpuppies are found in all varieties. Some add corn. Others have jalapeno peppers. A few use buttermilk. One or two even include beer. Some have sugar. Some don’t. Some shapes are round. Others are fat fingers. Almost all have chopped onions. Johnny and Jerry Evans, brothers and current co-owners of Greenbrier, experimented until they found what is now a famous, but tightly-held, secret recipe. There is much speculation about their mysterious ingredients and the proportions in which they are used. 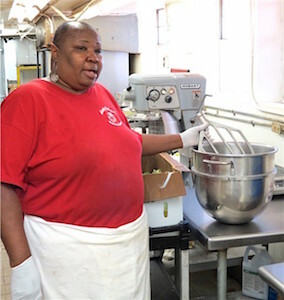 During an invitation-only, behind-the-scenes look at the process, Sheila Davis, the official mixer-of-the-batter at Greenbrier, showed her equipment. There’s no use asking for the secret. Sheila won’t tell. She appears to love her job and the Evans brothers. Michael watched the deep-fat fryer carefully until the hushpuppies were the perfect color of brown, then drained them, put them under the warmer, and showed off a fresh basketful. Creamy soybean oil was used for the frying process — another surprise. Perhaps that particular oil contributes to the light, notably non-greasy taste of Greenbrier’s brand of hushpuppies. Michael speculated that the most hushpuppies created at Greenbrier in a single day each year would be on Mother’s Day and Father’s Day. A much sought-after treat for all those hungry families! 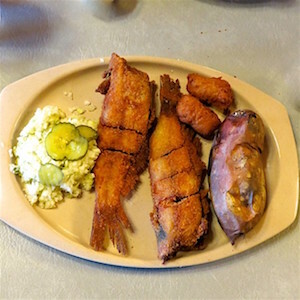 Hushpuppies are great accompaniments for ribs, brisket, pork, chicken, or beef, but the ideal pairing in the South puts catfish and hushpuppies side by side with slaw, a potato, and a large glass of sweet tea. It was remarkable that even though the hushpuppies had plenty of visible onion pieces, no overwhelming onion taste emerged. In the spring of 2015, Greenbrier was inducted into the Alabama Barbecue Hall of Fame. That honor is reserved for restaurants that have been in business for at least 50 years. Johnny Evans shared that both of his parents, Buddy and Bobbie Evans, and even his maternal grandmother, Louise (Memaw) Deemer, had once been at the helm of this family tradition during its delicious history. If you plan to visit Huntsville, Decatur, or Athens, Alabama, in the future, dress casually and take the short drive out in the country for a meal at Greenbrier. The address is 27028 Old Highway 20, Madison, Alabama 35756. A basket of hushpuppies will magically appear at your table as soon as you are seated.